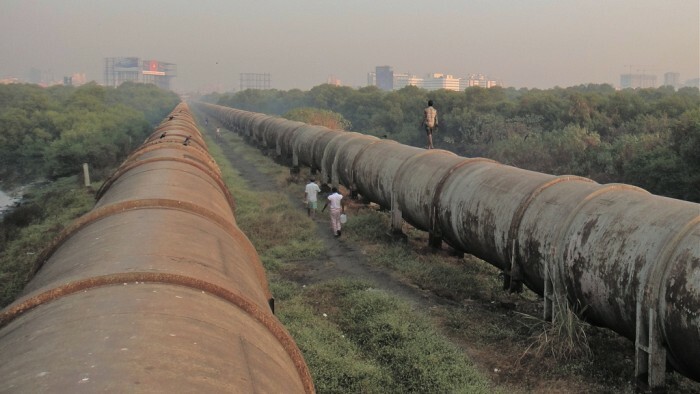 TAPI – An Innocent Pipeline or a Strategic Sword? December 13, 2015 revived the Turkmenistan-Afghanistan-Pakistan India pipeline in Mary, Turkmenistan. The 1,814 km long pipeline, built over the next three years, at a cost of $10 billion will transport 33 billion cubic meters (bcm) of natural gas per year – 5 bcm to Afghanistan, 14 bcm each to Pakistan and India. TAPI, dubbed as the ‘New Silk Route’, aims at increasing regional harmony between Central and South Asia through energy trade. The pipeline project binds together countries that have delicate relations with contracts for over the next 30 years. Given the importance of the pipeline and the gas it brings to the energy deficient nations of Afghanistan, Pakistan and India, they will have to maintain the security cover to save it from the alleged state and non-state actors, thereby being a beacon of hope for some peace in the region. Amid fragile Indo-Pak and Pak-Afghan relations, the “ground-breaking” ceremony was called a historical event by Ashraf Ghani, the Afghan President. India’s participation comes at a time of considerable energy ease and a positive strategic environment. Iran’s nuclear deal with the US has widened the energy (gas) window for importers all around as the sanctions have been removed resulting in more gas pumped into the market already reeling with low prices; oil price is flooring at $35 a barrel thanks to US shale boom and oil over-production. With the pipeline, not only New Delhi and Islamabad have secured long-term supplies, Kabul is looking at an additional annual cash flow of $500 million. Timing of the pipeline-push, however, may have to do with something more than oil and cash. The ground-breaking ceremony has happened at a time when China has begun constructing the Power of Siberia-II pipeline, casting serious aspersions on the sanctity of the project, the advantages of which will not necessarily be restricted to the four nations involved. May 2014 witnessed a historic collaboration between two powers of the East, Russia and China. Gazprom and China National Petroleum Corporation signed a 30 year $400 billion deal for supplying 30 bcm of natural gas annually, from Western Siberia into China, through the ‘Power of Siberia-II’ pipeline. Politics behind Russia’s plans to diversify its gas exports and to look beyond its largest market, Europe, cannot be ignored. The deal came at a time when the US and EU sanctions following the Ukraine crisis had left Russian economy limping. For Moscow, Beijing was its market alternative, giving it steady gas market for 30 years at market-pegged price and a possible inroad into Asia. Although currently the Beijing promise seems to have hit a bit of a road block. Even as consumption is increasing, growth rate has been on a steady decline (from 8.5% in 2014 to 2% in Q1 2015) and stock market has seen its worst fall. While Moscow will be keeping a close eye on the Shanghai Index, economists believe it may have bigger worries like oil and gas export sanction, given its recent geopolitical activities that include the annexation of Crimea and the uprising of pro-Russian sentiment in parts of Ukraine. The deal serves China well beyond the obvious pumping of fuel to the Chinese industries. On the energy front, a surge in gas supplies will ease the pressure to develop its shale gas reserves, which can act as strategic assets in the future. Strategically, a closer Russia – China partnership could pose a formidable challenge to the US’ pivot in Asia. The deal’s biggest contribution, however, comes in its ability to showcase the potential of two US rivals to get each other’s back when either is down economically. A Chinese or Russian economic slowdown has long been the US’ window of gaining strategic advantage in the region and putting pressure on both on issues of security and human rights. This is in addition to the Chinese and Russian strategic alignment on Syria and Iran. TAPI’s potential as the US’ counter-force to the Sino-Russian energy alliance cannot be undermined. After all, TAPI’s 1995 origins lie in Washington, through a US firm Unocal, providing Central Asian and South Asian nations an alternative to the Russian routes. Since the Iran-Pakistan-India pipeline failed to take off with India, and involved a participant reeling under US sanctions, TAPI was the only feasible option that could match the timeline of the Sino-Russian deal. Washington also hopes TAPI would decrease India’s reliance on Iranian gas while providing the much-needed energy security for New Delhi to act as challenge to Beijing’s supremacy in the region. India is a formidable beneficiary of the TAPI pipeline, with 14 bcm of natural gas arriving in the country every year, in addition to its other sources of gas import and production. While TAPI certainly has the potential of becoming a great strategic asset, doubts remain whether it would be a secure one. TAPI would go through a war-ravaged Afghanistan and a turbulent Pakistan while the Sino-Russian gas just has to brave the Siberian chill. Regional stability will be key to TAPI’s evolution from a pipeline into a strategic sword in the battle for regional supremacy. The Siberia – TAPI duel could result in geopolitical carnage. Is the ground-breaking of TAPI a landmark that signals a departure from history of scepticism into a future of cooperation? Or is it the latest front in Cold War 2.0? Ashay Abbhi is a Research Analyst based out of Noida, India. He works in the Energy domain and was a Lecturer at the London School of Energy Studies before entering the corporate sector as a researcher.